We offer custom and Off the Shelf Connector Accessories, such as Cable Bushings, Cable Fittings, Cable Boots, Cable Grommets and Cable Strain Reliefs. We provide cable design and cable engineering services for: electronic and electrical cables, PCBs, sensors and other devices, which require, or become enhanced by overmolding the connectors. We have a vast expertise in cable strain reliefs, cable grommets, cable bushings, cable fittings, and cable boots. We use the newest molding materials, such as rubber, plastic / PVC, polyurethane and santoprene, to develop molded cables that are operational, environmental and aesthetically superior . 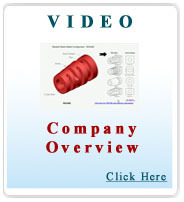 If you would like to design your own cable grommet, please try our 3D Online Grommet Design Tool. If you are interested in a Cable Strain Relief Solution, please try our 3D Online Strain Relief Design Tool. What is a Cable Grommet? What is a Cable Strain Relief / Connector Strain Relief? What is a Cable Bushing / Strain Relief Bushing? What is a Cable Fitting / Strain Relief Fitting? What is a Cable Boot / Strain Relief Boot? When do I need these Connector Accessories? What overmolding material do I need to use? Our specialists are ready to answer all your questions and to provide you with a cable or PCB overmolding solution! Please see below a connector accessory tutorial for military & industrial electrical connectors. Since these circular and rectangular connector cables require most accessories we present some of the possible configurations. A connector accessory may be defined as a component used with a connector to enhance its operational characteristics but which does not interfere with its basic function of connecting and disconnecting electrical circuits. In many situations however, the useful life of a connector would be severely compromised without the proper accessory. The extensive range of connector applications and usage environments accounts for the wide variety of accessory configurations, each one designed to meet a specific need. Non-Environmental Backshells are sometimes referred to as backshell extenders. They are used when there is a requirement for additional space between the rear of the connector and the strain relief to allow for cable service loops, jumping, filter networks, etc. Backshells categorized as Environmental are those which protect the wiring side of the connector from dust, dirt, moisture and fluids. Almost all recent Military Specification cylindrical connectors are designed so that when the wires are inserted through the grommet, and assuming all holes in the cable grommet contain either a wire or a sealing plug, the connector will be enviromentally sealed once the backshell or strain relief is secured. The environmental seal will remain funtional as long as the wires entering the cable grommet are not bent more than 13 degrees from the axis of the connector. The exact number of degrees which the wires can be bent depends upon the type of wire and insulation materials used. If any bending or flexing of the wire bundle is anticipated, some type of strain relief or cable clamp and backshell must be utilized to maintain the integrity of the environmental seal. Most cable design for transmission of electrical power or high voltage signals is relatively unaffected by electrical interference. However, the introduction of foreign electronic energy into cables carrying low voltage data signals can have disasterous results. The lower the system signal voltage levels, the greater the susceptibility to interference. Electromagnetic Interference (EMI) and Radio Frequency Interference (RFI) can originate from a number of sources. Notorious generators of interference include components such as coils, electromagnets, electric motors, transformers and a variety of radiating electrical equipment like fluorescent lighting, high power radar, broadcast stations, teletype and other communications circuits. When strong external noise fields exist, the conductors of a cable act as antennas and pick up the radiated signals. The reception of this interference results in inaccurate or interrupted data transmission. Today, with cabling carrying more low voltage data signals than ever before, proper shielding is of prime importance if the integrity of the transmitted data is to be maintained. An effective shield should be capable of preventing the reception of undesired signals as well as confining extraneous signals generated within the cable itself. The most common method of shielding against EMI/RFI is to enclose the cable in a tightly woven metal braid comprised of wire strands which is then terminated at one or both ends of the cable to ground potential. The termination and grounding of the shield is accomplished by using a suitable connector backshell. Many military programs require Electromagnetic Pulse (EMP) protection. Designing against EMP is basically the same as designing against EMI/RFI. The best cable shields for EMP are solid materials such as rigid conduit or pipe. However, where light weight is a consideration, metal braided shields can be used effectively. The mechanical assembly of the shield must have clean metal-to-metal contact with the backshell. Continuity is extremely important in EMP protection. There must be a 360° circumferential mechanical bond and electrical continuity between the shield and the connector backshell. Shielding voids or pigtail terminations do not provide acceptable EMP protection. A variety of backshell configurations are available for termination of cable shielding. The cable designer can select from Cone and Ring, Light Bulb Thread, Compression Spring, Magnetic Forming, Crimp Ring Or Stainless Steel Strap Configurations. The Cone and Ring method has been used for over 60 years, originating with coaxial (UG type) connectors. Several variations of this concept have evolved and are widely used as they provide excellent shielding as well as strain relief capabilities. All variations are based on the basic Cone and Ring design in which the cable braid is placed between the inner and outer ground rings at the rear of the backshell. As the cable strain relief or cable nut is tightened, the braid is clamped between the two rings. Other variations of this method included shield tie-off, inverted cone and 3-ring shield grounding. For optimum performance, the Cone and Ring shield termination requires a great deal of care by the assembler. To assure 360° continuity, the braid must be combed out so that there are no high spots when the Cone and Ring come together. Care must also be taken to prevent cutting the soft copper wires of the braid on sharp edges or by overtightening the strain relief. The fact that this method is fully field repairable accounts for its popularity. As the name implies, the outside rear of the backshell has coarse round threads similar to an ordinary household light bulb. A cable nut with corresponding threads is slipped over the braided shield. The shield is then distributed evenly over the backshell threads and the nut is screwed in place, securing the shield to the backshell. This method is field repairable but requires care to be sure the braid does not tear as the nut is tightened or removed. These backshells have no strain relief provisions for the cable or conductors. If a jacketed cable is used, environmental sealing can be achieved with the use of a heat-shrinkable boot over the backshell and jacketed cable. The Compression Spring is sometimes called a Ground Spring Backshell. A ring-shaped coil spring is placed over the braided shield and positioned in the rear of the backshell. A backup ferrule is sometimes used between the conductors of the cable and the braided shield to eliminate the possibility of cutting into or through the shield if the cable clamp or compression nut is tightened excessively. This method of shield grounding is simple, field repairable and requires no special assembly skills. Compression Spring Connector Backshells are best used in applications with little or no vibration. It has been reported that under certain vibration conditions when a backup ferrule is not used, the spring will bounce and shielding integrity could be compromised. EMI/RFI Backshells are available in both Environmental and Non-Environmental configurations. Shield Termination Backshells are used to terminate the outer braid shield of a cable by means of a magnetically formed ring, a crimp ring or a stainless steel strap. Their configuration is distinct from EMI/RFI backshells in that they rely entirely on the ring or band for strain relief rather than on a mechanical clamping device. Magnetic Forming is based on the principle that a pulsed magnetic field generated near a metal conductor can produce pressures up to 50,000 psi capable of reshaping the metal conductor (in this case, a metal ring) without physical contact. After the braid is placed over the backshell end and the metal ring (which has a zero temper) is in position, the assembly is placed in a magnetic forming machine which induces a very intense magnetic field by the discharge of high voltage capacitors. This field sets up an opposing field in the metal ring and the net Magnetic Force compresses the ring onto the backshell, securely clamping the braid. Magnetic Forming is currently the preferred EMP termination method as a 360° bond is assured. Magnetically formed assemblies are not field repairable and the cost of the forming equipment is in the $50,000 range. Magnetic Forming Backshells have no provision for strain relief of the cable or conductors, however, the ring is crimped so tightly that the shield material will break before it will pull free of the backshell. There is a tendency for the finish of the aluminum ring to crack and expose base metal when the ring is formed to the backshell. Under certain conditions, these cracks promote corrosion which affects the conductivity path. In extreme instances, the rings have corroded so badly that they have fallen off. Environmental sealing can be obtained by using jacketed cable and a heat shrinkable boot over the assembly. Crimp Ring shield terminations are similar to Magnetic Forming except that the ring is crimped to the backshell with a hydraulic tool. Some users do not like this concept in that there can be areas of little or no contact when using a hex -crimp die. A new method which eliminates any voids has been developed. This method produces a circumferential crimp using a stainless steel ring. Use of the circumferential crimp and stainless steel ring eliminates any possibility of the ring corrosion problems associated with magnetic forming. Crimp Ring terminations have the same strain relief, environmental and field repair parameters as those of Magnetic Forming. As noted above, Magnetic Forming and Crimp Ring terminations are not easily field repairable. The Cone and Ring, Light Bulb Thread and Compression Spring methods are field repairable but require some level of skill and care in assembly and disassembly to avoid damage to the braided shield. The Stainless Steel Strap was developed in an effort to circumvent these shortcomings. The Stainless Steel Strap resembles a metal cable tie and is tensioned by a tool. The strap is held in place by the tension applied to the strap locking mechanism by the hand tool. Easily field repairable, the procedure requires no special assembly skill. The backshells have no provision for strain relief, but environmental sealing is obtained by using jacketed cable and a heat-shrinkable boot over the assembly. As can be seen, the designer has a wide variety of terminations and features to choose from. The characteristics and features of each termination type are summarized in the following table. Environmental EMI/RFI Backshells resist both physical and electrical contamination. 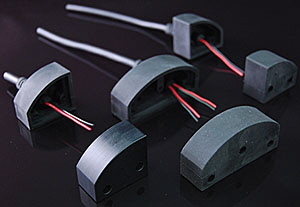 Due to the severe operating environments connectors are subjected to today, they have become the most widely used backshell for military applications. Grommet Nuts can be described as metal rings with inside threads. They were originally designed for use with solder contact connectors to provide environmental sealing. Since solder contacts are non-removable and must be wired in place, the rear sealing grommet is supplied as a loose piece. The wires are threaded through their respective holes in the grommet, and the grommet is postioned over the wired contacts when soldering is completed. As the Grommet Nut is tightened, it holds the grommet in place and compresses it around the individual wires to effect an environmental seal. Grommets of crimp contact connectors are self-sealing and are a non-removable component. These features make the use of Grommet Nuts redundant for sealing purposes. Their only function on a crimp contact connector would be to protect the rear accessory threads and teeth of the connector or to protect the outside of the grommet if it extends beyond the rear connector shell. In the 1950.s, encapsulation potting of electronic components and assemblies was introduced as a method of environmental sealing. Potting became a popular means of sealing connectors since it produced a more positive seal than the rubber grommets in use at the time. Weight reduction was also achieved because potting eliminated the need for grommets, ferrules, backshells and strain reliefs. Potting Boots act as molds or forms to contain the liquid potting compound until it sets or cures. Potting Rings are used to attach the Potting Boot to the rear of a connector, however, some Potting Boots are designed to fit the connector without the use of a Potting Ring. In commercial applications, potting is an acceptable method of cable termination. Shrink Cable Boots are used to environmentally seal a jacketed cable to a connector. The Shrink Boot Adapter is a specially designed backshell which attaches to the connector's accessory threads and provides the necessary gripping area for the Shrink Boot. The Shrink Boot and Adapter are slipped over the cable and after wiring is completed, the Adapter is attached to the connector. The Shrink Boot is positioned over the Adapter and the jacketed cable. As heat is applied to the Shrink Boot (usually with an electric hot air gun), it shrinks tightly around the Adapter and cable forming an environmental seal. In addition to the basic configurations, manufacturers offer a number of Shrink Boot termination variations including Crimp Ring, Cone and Ring, Integral Woven Braid, Stainless Steel Band and Light Bulb Thread. Movement of a cable can produce stress which, as it is transmitted toward the connector, can result in wire breakage, wires coming loose from the contacts, contacts being pulled out of the insert or any number of disastrous consequences. The function of a cable strain relief is to hold or grip the cable fast at some point anterior to the location where any damage can potentially occur. Any stress or strain on the cable is then transfered through the strain relief to the connector shell and the area of potential damage is thereby protected. One point that has always presented some confusion is the interchangeable use of the terms Cable Clamp and Strain Relief. Cable Clamp - Any cable support or clamping device which requires the use of an intermediate component for attachment to the back (wiring side) or the connector. Strain Relief - Any cable support or clamping device that attaches directly to the body of the connector. Cable Clamps and Strain Reliefs are usually shipped unassembled. The reason for this is that unless a cable of minimum diameter is used, the clamp must be disassembled prior to use. On all Cable Clamps and Strain Reliefs which utilize two straps (or saddle bars), care must be exercised to assure proper assembly. There is a proper and preferred method of assembly: the clamp screw heads are oriented so that any torquing force applied with a screw driver is in a direction that will tighten rather than loosen the attachment between the Strain Relief and the connector or backshell to which it is fastened. These accessories are used when it is necessary to route a cable through a bulkhead or panel. Bulkhead Adapters utilize flange or jam nut mount styles. They are available with environmental sealing, shield terminating, strain relief and angular options. The resemblance between these parts and those found in a plumber's kit is more than coincidental. and mounting panel. Gaskets containing conductive material are used to ground the shell for EMI/ RFI protection. Mounting Nuts are used to secure a jam nut receptacle to a panel. The usual way to mount a wall or box mount receptacle to a panel is to use four screws, flat washers, lock washers and nuts. This mounting hardware can be dropped or lost. Mounting Plates have captive self-locking nuts which eliminate this potential problem. The use of Mounting Plates also speeds up and simplifies the mounting of connectors on large panels where it is difficult or impossible for one person to do the installation using standard loose hardware. As the name implies, these Adapters provide the means to interface with conduit having pipe threads. incremental sizes are telescoped to build up the cable diameter. Bushings are also used to protect the wire bundle in the clamping area of the Strain Relief. These devices are used to terminate shields of individual wires in the cable bundle. Shorting Cans provide a total enclosure for the rear of a connector. They are used for the fabrication of shorting plugs, special purpose test connectors or for the installation of discrete components. E-mail or Call us Today for Connector Accessory Solutions!